In January I rewatched the Sharpe movies made in the mid-90s, based on the Bernard Cornwell novels about the Napoleonic Wars and starring Sean Bean as Richard Sharpe, for the first time in years. The only ones I didn’t watch are the two post-Waterloo movies made about a decade ago that are set in India; I’ve seen them (and wrote about the first, Sharpe’s Challenge, here), but I don’t have them on DVD. Sometimes I’ve imagined there’s a Napoleonic Era shared universe — Horatio Hornblower and Jack Aubrey are on the high seas, Richard Sharpe is on the ground in Spain, Bezukhovs and Rostovs and Bolkonskys experience the war in their own way in Russia, Etienne Gerard leads Napoleon’s hussars into battle across Europe, and occasionally their paths cross in various ways. Hornblower comes from the novels of C.S. Forester and Aubrey from the novels of Patrick O’Brian. Sharpe, as mentioned, comes from the work of Bernard Cornwell, and the Russians come from Warren Peace’s Leo’s Toy Store. The name that would be unfamiliar to most readers would be that of Etienne Gerard. Between 1894 and 1903, Sir Arthur Conan Doyle, the creator of Sherlock Holmes, wrote nearly twenty short stories about Etienne Gerard, an officer in Napoleon’s cavalry. The Gerard stories fall neatly into the gap between the death of Sherlock Holmes in “The Final Problem” and his resurrection in “The Empty House” a decade later, with the Gerard stories interrupted by the writing of The Hound of the Baskervilles halfway in between. The Gerard stories were collected into two volumes, The Exploits of Brigadier Gerard and The Adventures of Brigadier Gerard. They span nearly twenty years of history: Gerard’s training (roughly during the Peace of Amiens in 1802-1803) to the Polish campaign of 1807, the Peninsular War in 1809, the invasion of Russia in 1812, the invasion of France in 1814, the battle of Waterloo in 1815, and finally Napoleon’s death in 1821. After watching Sharpe, with my brain firmly planted in the 19th-century, I decided to revisit the Gerard stories. I’d read them over a decade ago; I’d bought a trade paperback of the complete stories at the Barnes & Noble on Broad Street in Richmond, near Willow Lawn, in November 2005. (I was on my way to Baltimore to my grandmother’s house, I’d stopped for dinner, and went in a bookstore. The mind remembers obscure and specific details like these.) The stories weren’t fresh in my mind at all, so I felt like I was coming to them fresh. Gerard is an interesting character. The stories are narrated in the first person — Gerard, long since retired and now some thirty years since Waterloo, regales listeners at a tavern with tales of his derring doo long ago — and there’s a tall-tale quality to some of the stories. Gerard insists that he was the best horseman, best swordsman, best lover, and bravest soldier in all of Napoleon’s armies. At first, it seems that Gerard is simply an unreliable narrator. But it quickly becomes clear that Gerard is something else, something much more interesting. Gerard is an unaware narrator. Quite simply, Gerard doesn’t realize that he’s not particularly bright, not especially liked, and definitely not respected. He’s not a good leader, he makes terrible decisions, he’s assigned duties simply because he doesn’t ask questions and he’s completely expendable. He’s lucky more than he’s skilled, and opponents (particularly women) take advantage of his simple nature all the time. What successes he has are through dogged determination more than anything, and it’s always in spite of himself. What’s remarkable about Gerard, even though it’s obvious to the reader, from Gerard’s own words, that he’s all of these things, is that he himself is aware of none of it. He really and truly believes he was the best and smartest officer in Napoleon’s army. As an historian (at heart and by schooling), there’s so much of the Napoleonic Era that Doyle missed in these stories, and I wish Doyle had continued to write Gerard tales, more than a one-off a few years later (“The Marriage of the Brigadier,” the earliest chronologically of the stories), after he’d resurrected Sherlock Holmes. Like in the Sherlock Holmes stories, Doyle has his narrator mention unchronicled tales, like Gerard at Austerlitz or a duel with a dozen Italian swordsmen, and there’s ample history that could be covered. At the same time, I’m not sure there was anything else Doyle could have done with the character of Brigadier Gerard. There simply weren’t the facets of character there to explore. T here wasn’t anything else to say. And Doyle himself was aware of that. 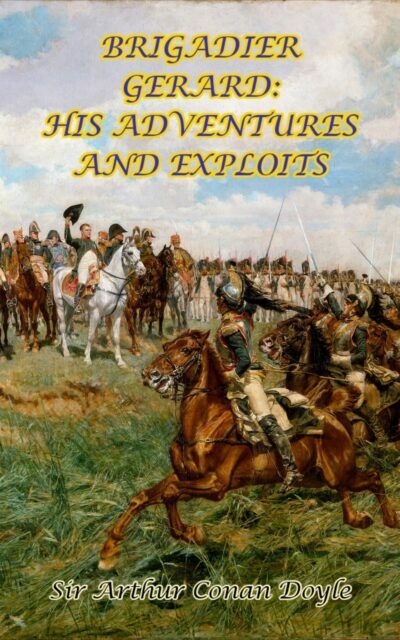 The final story chronologically, “The Last Adventure of the Brigadier,” about a scheme to liberate Napoleon from St. Helena, has Gerard admit as much, that there’s nothing left to say about himself and his adventures. Doyle’s Brigadier Gerard stories are today little more than curiosities, read by only devoted fans or scholars which I think is unfair. These stories have their charms. There’s wit in them, and they star a memorable lead character. Even if there is no Napoleonic Wars Shared Universe, in my mind, Richard Sharpe and Etienne Gerard must have faced off across a battlefield at least once. Surely.